Photo: Newfoundland and Labrador Fur Breeders Association. What are you doing to protect fur and the industry? The fur trade has faced many difficult challenges over the past few years. These include fast-changing lifestyles, new and cheaper (and usually synthetic) clothing materials, vertically-integrated companies, multi-national fashion-marketing giants … and, of course, sensationalist animal-rights campaigns that spread disparaging and false information about our industry. The fur trade has done a remarkable job of dealing with these challenges, especially considering its small-scale, decentralized and largely artisanal character. The increased use of fur in small pieces (vests, jackets), trim (on parkas) and accessories (hats, scarves, handbags) has made fur more accessible to more, and younger, people than ever before. We see more fur now on the catwalks and in the streets than we have for decades. Nonetheless, we know we still have lots of work to do. Animal activists continue to spread misinformation that can confuse consumers. Their latest strategy is to pressure fashion and outerwear retailers to drop fur from their inventories. And such pressures can be very difficult for consumers and retailers to resist, especially if they are not sure whether the fur trade is responsibly managed. The truth, like it or not, is that our industry is too small to expect our professional associations and breeder groups to solve these problems alone. We all have to pitch in to protect fur tradespeople and get our messages out to consumers, designers, retailers, media, politicians, and the general public. Here are some ideas about things that YOU can do to help. And we’d love to hear some of the other things that YOU are doing to let people know about our remarkable, heritage industry. Explaining the skilled and time-consuming processes that go into a hand-made fur garment can give consumers a new appreciation of what we do. 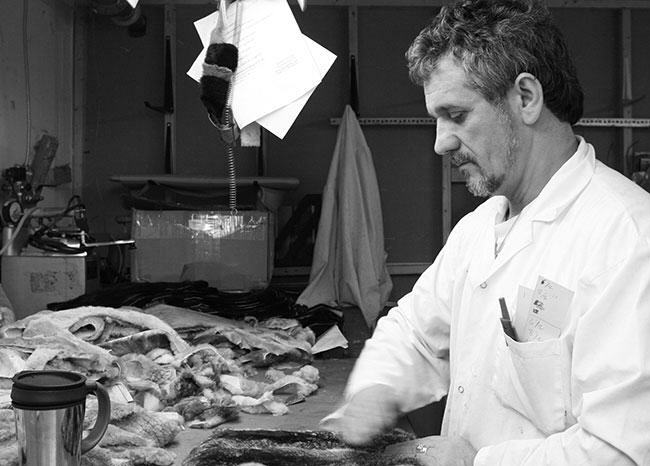 For more photos of fur design and fabrication, visit Truth About Fur. Photo: Claire Beaugrand-Champagne. Be active online. Comment on news articles and on social media, presenting polite and knowledgeable arguments to defend the trade. Even if people don’t comment back, people are reading. Let’s present ourselves as an industry that is confident about its processes. Answer customers’ questions honestly, and if they press you about issues, respond accordingly. Have the information ready and know the facts. Our industry has often been misrepresented, so we need to be especially open with our customers. 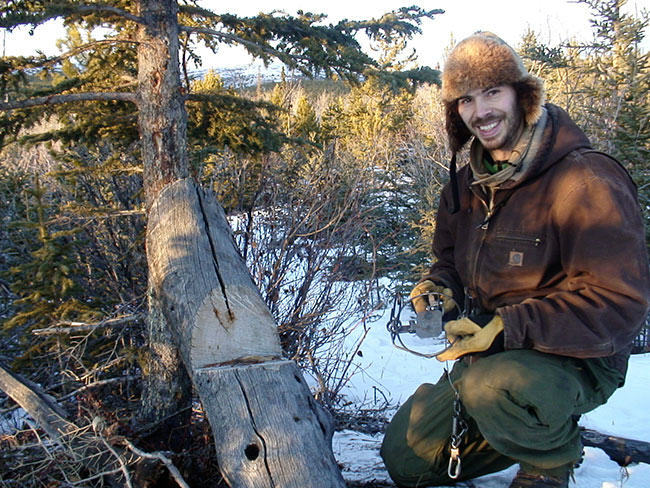 Educating current and future trappers is a vital function performed by trappers such as this one from Environment Yukon. Here he installs a live-holding trap to capture lynx for relocation to the US. For more photos of trappers at work, visit Truth About Fur. Take guests out on the trap line from time to time. It may slow you down, but it is worth it. Read more on taking people out on your trapline. Volunteer to hold classes and teach people about what trappers do. Educate the young. The key to sustaining this wonderful activity and to protecting fur trapping is to get young people interested in it. Be active online about what you do, how you do it, and why you do it. Trapping is very complex and it is important to understand the benefits trapping brings to wildlife populations and how licenses fund responsible conservation. Ally yourself with hunters and fishermen. Sportsmen need to work together to strengthen and protect their rights. For strong debate arguments, check out our Q&A section about trapping. 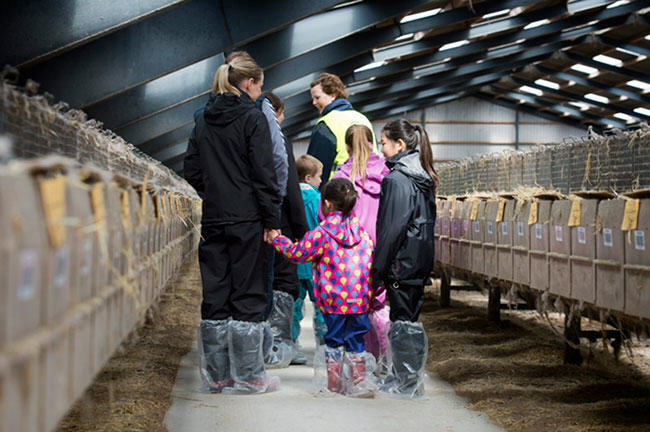 Fur farm tours are the surest way to convince people what a responsible industry we are. Open your farm up to visitors. Inviting people onto your farm gives you the chance to educate them on how the industry works, and show you have nothing to hide. Contact your local or national fur farming association (Canadian Mink Breeders Association or Fur Commission USA) for information on how to organize such an event. Answer questions. Fur farming should be easy to defend. Animals must be treated well in order to have nice fur, and even the activists can’t deny this obvious fact. If people have questions about the animals’ pens, food, and health, be honest and tell them what you do and why you do it. Remind people that fur farms are an integral part of the human food chain, and that the animals eat leftovers from chicken farms and fisheries. Be active on online. Many farmers show photos of their animals and the daily life of farm work. Being open and transparent about your work is key to ensuring we protect fur farming and get people to support it. Ally yourself with other farmers and support the farming trade. Sticking together is key to protecting the farmers of North America. For strong debate arguments, check out our Q&A about fur farming on our website. When people see and touch real fur, they understand that fake fur can never compare. Shown here, a sheared mink coat with fox collar, by Natural Furs. Be active online! Comment on articles and social media. Share the truth, dispel myths, and remind people that there are lots of us that support the trade. Work hard to debunk myths and share positive fur trade information on all of your personal networks. Check out the Truth About Fur website to brush up on the facts, and refer people to it if they have questions about the trade. Support brands who sell fur, and try to avoid brands who have an anti-fur stance. Buy fur! Whether you are buying new, vintage, a coat, or an accessory, one of the best ways to support and promote this remarkable heritage industry is to buy and wear fur products. Support real animal welfare and conservation, not “animal rights”! Make sure you know the true agendas of any charities you support. If you care about pets, always donate to your local shelter and not the national “animal-rights” groups such as PETA and HSUS. Read up on charitable donations. When you wear fur, tell people why you do it. Be vocal about your support of the trade and don’t shy away from expressing it. Stay in touch! If there is an important issue we need to address quickly, contact us by email, Facebook, Twitter, or Instagram. Do you have an amazing story to share? We want to post it in our Truth About Fur blog. Help us be the go-to place to represent the true image of the industry. Send us your beautiful pictures. We welcome your comments and contributions. Are animals skinned alive for their fur? What happens to the rest of the trapped animal once the fur is taken?